Taking an avalanche course is an important step in your backcountry education. Read on to learn about the different types of courses and to find a course provider near you. The American Avalanche Association endorses the following training progressions for recreationists and professionals who make decisions in avalanche terrain. Detailed course descriptions and prerequisites for formal U.S. avalanche training and education. AWARENESS: Aspiring backcountry travelers. Always wanted to explore snowy mountainous terrain? Gain an introduction to the avalanche phenomenon, causes and risk. Learn where you can find the gear, resources, and training to responsibly enjoy winter recreation. Begin to recognize and avoid avalanche terrain. LEVEL 1: Current and aspiring backcountry travelers. This three-day course (24 hours of instruction, combination classroom and field), taught by experienced avalanche professionals, will introduce you to the concepts of avalanche hazard assessment, decision-making, and rescue. One of two foundational courses in the A3’s recommended progression, the Level 1 will provide you with a sound understanding of the basics, including tools you can use to make decisions about when to go/not go and how to conduct yourself in and around avalanche terrain. This is a cornerstone course for any person who travels in snowy mountainous terrain. RESCUE: Any individual who travels in snowy mountainous terrain. This one-day course (8 hours of instruction, combination classroom and field) focuses exclusively on how to be prepared and respond to an avalanche incident. Gain hands-on experience with techniques of companion rescue. Most avalanches that carry and/or bury a person are triggered by that person or someone in their party; an immediate response by member(s) of the group involved is the best chance for survival. Avalanche Rescue is one of two foundational courses in the A3’s recommended progression. Be ready to save a life; always travel with someone you trust to save yours. LEVEL 2: Advancing winter backcountry recreationalists with prior avalanche training and experience. Are you a dedicated winter recreationalist who yearns to explore more challenging and complex avalanche terrain? 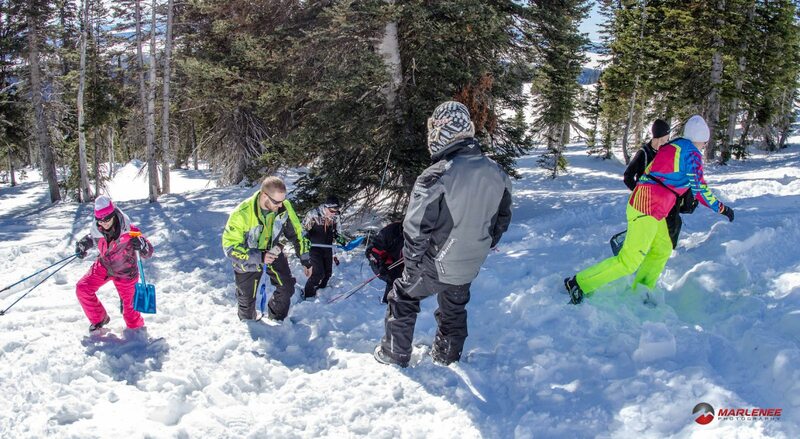 If you’ve taken the Level 1 and Avalanche Rescue and are continuing to venture into the winter backcountry, then the Level 2 course is for you. Build upon the foundation you developed during your prior training. Gain a deeper understanding of the nuances and intricacies of avalanches. Further hone your hazard assessment and decision-making skills. Begin to understand how to choose terrain to match the current avalanche conditions. Prerequisites: Level 1 and Avalanche Rescue. BRIDGE COURSE: Fast-track 1 or 2 day course that covers the Pro 1 evaluation and course proficiencies for individuals to gain recognition within the new system. This course is for current avalanche professionals ready for Pro1 evaluation who need minimal refresher skills before being tested. Individuals must pass the Bridge Course to gain Pro 1 recognition in the new system. Bridge courses will be offered through the transition period 2017-2020. Prerequisites: Level 2 and at least one full winter season of relevant work experience. Prior practice and preparation for Pro1 standards and techniques recommended. PRO 1: Entry-level avalanche professionals, newly employed or seeking employment within the industry, and/or seasoned avalanche professionals who wish to refresh their skills and get up-to-speed with current practices. The five-day Pro 1 course focuses on skills and proficiencies to enable an individual to be a contributing member of an operational avalanche program. The student will be taught, coached, and evaluated on the proficiencies required of a skilled observer who effectively collects and contributes professional information and opinions to risk management discussions and operational decisions. Prerequisites: Level 1, Avalanche Rescue, and at least one full winter season of relevant experience. PRO 2: Developing avalanche professionals with several seasons of applied professional experience and/or seasoned professionals looking to develop skills applicable to leadership roles within their operation. The six-day Pro 2 course focuses on skills and proficiencies that enable the student to step into a leadership role within an operational avalanche program. The student will be taught, coached, and evaluated on operational risk management decision-making skills, including forecasting, risk mitigation strategies, and professional communication. Prerequisites: Pro 1 certificate, at least two full winter seasons of operational avalanche experience (verified by a letter of reference), and submission of examples of professional documentation. PROAVSAR: This stand-alone course supports professional SAR programs and operations. ProAvSAR students may or may not have taken another course in the Pro Training progression. The AAA anticipates that these courses will become an official part of the Pro Training Program starting in winter 2018/19. Access American Avalanche Association endorsed course providers by state. Are you a course provider? Apply to get listed here. The purpose of listing course providers on this website is as a public service to promote avalanche education by providing a critical link for the recreating public to increase their knowledge and awareness of avalanche hazards. The listing also assists individuals and organizations in connecting with avalanche education programs in their geographic region. Course providers are listed on avalanche.org and americanavalancheassociation.org because individuals in the organization are members of the A3, and according to representations made by these A3 professional members, their independently developed curriculum, courses and programs are consistent with A3 education guidelines. A3 believes that avalanche education can be more thoughtfully, consistently and responsibly conducted and can achieve more constructive outcomes for students when course providers and avalanche instructors in the United States strive to embrace common guidelines and practices. Course providers operate independently of A3. A3 does not oversee, control or warrant the character or quality of listed course providers’ businesses or programs and is not responsible for the content of their specific courses or programs. Those interested in taking courses from listed providers should independently investigate and assess these course providers and their specific courses and programs. A course provider’s listing on this website does not guarantee that a course provider’s courses or programs will be safe, or that participation in that course or program will be free from harm. In choosing to voluntarily engage in avalanche courses or programs or recreate in outdoor, backcountry and/or wilderness settings, participants must understand that they accept and assume the inherent risks of these activities, and share in the responsibility for their own well-being and the well being of others on the course, program or trip.